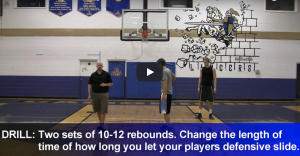 This rebounding drill is among the thousands of resources for both coaches and player available from basketballhq. Make sure that your speakers are on to hear the narration and that you can access You Tube to see the videos. Like everything I post on the site, you will need to tweak the drill to fit your philosophy and needs. You might want the rebounder to simulate the movements of a defensive possession rather than doing lane slides. You might want them to simulate boxing out, hit and get, or whatever technique you use. You also can make the shots miss off the rim rather than the backboard. Click the play arrow to begin the videos.